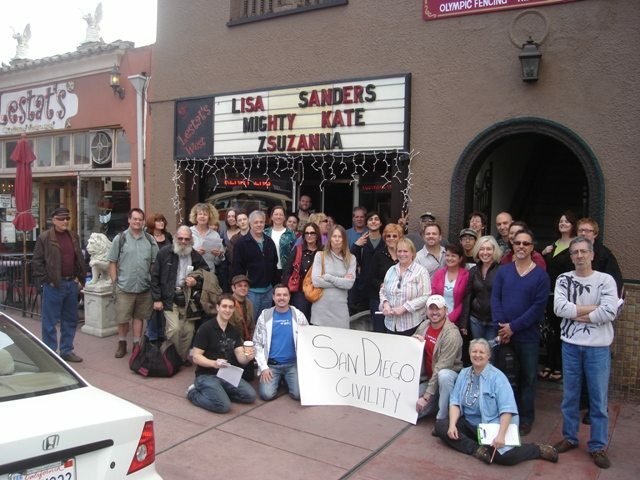 San Diego Coffee Party Movement first meeting gets a big turn-out! We had a wonderful turnout – 75 people signed in and signed the civility pledge! It was wonderful to see the packed house, it was standing room only. Lots of people stood and attested to why they had come, many saying they were frustrated the way the media was portraying the average citizen and that they felt we needed a voice, a sane and civil voice, to be heard on the issues that matter to us all. The meeting was organized by Mike James and Frank Gormlie after becoming aware of the movement only two weeks ago. Frank led the first part of the meeting, laying out the ground rules, the short history of the movement, the purpose and the intended scope of the meeting. We split into four groups, generally based on where people were coming from geographically. We discussed topics that were important to each group, decided a location where the smaller groups could meet on the 27th of March (or sooner) and got to know each other a little bit. The group I was in pledged to try and bring someone with us to the next meeting. I was proud to see so many people there, especially many people who said they had only heard about it that morning. I am inspired and look forward to more. Wake up and stand up! We just caught the Channel 8 news report on the meeting today. Except for the reporter’s beginning statement that we agree with the Tea Party’s points (the difference being we will voice them civilly), we thought it was a decent report. actually their emphasis on civility in the tv report drew a very nice contrast. The Channel 8 NEWS at 6:30 was even better. The reporter changed her opening so it sounded less like the coffee party agreed with the tea party, plus at the end they gave out the website. These efforts should be applauded and loudly! A turnout this large before anything concrete has happened shows how disaffected the voting populace has become, and how disappointed people are with the Obama administration and the Democrats who promised change. Unfortunately I do see a big similarly with the Tea Party that I hoped I wouldn’t notice, but stuck out like a sore thumb to me. The color, or rather, the lack of color in the participants. JPinSD, for some reason your comments are going into the spam folder. I happened to catch these but I don’t usually check the spam before I delete it, sorry ’bout that. does it have anything to do with with email address or maybe my ip? I will be out of town 3/27, but please tell me when and where the next San Diego coffee party meets! I want to be there! I am looking forward to the next local coffee party to see what it will be like. I have attended tea parties and I have to disagree that I saw any racism, violence or incivility. All I saw were people lining up to talk and tell what was frustrating to them. Maybe there are tea parties going on elsewhere where these other things happen and I just haven’t seen them. I did watch a coffee party in DC on C-span last night and I liked several points that were raised and I think I get the direction they want to go in but, for anyone to imply that everyone who has ever held a sign or attended a tea party is not civil or is a racist seems wrong to me. I would like to see the coffee party and the frustration of the tea party movement come together and make positive changes in the way the govt conducts business because I think we all agree that the process has so many of us disenchanted. Sharon – Be advised that these Coffee Party meetings occurred 2 years ago, and as far as I know, there is no active local group any more. There are other groups, however, that are just as great and more active locally, like Save the Bill of Rights, MoveOn San Diego, the Occupy movement, Common Cause, …. the list goes on.